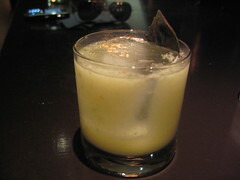 Fortunately, my favorite drink of the night was made just for me – called Saving Grace. I’ve really been into bourbon drinks lately and ginger goes great with bourbon so this was a perfect combination for me. Mint is shredded on top for a refreshing finish. The vanilla manhattan wasn’t one of my favorites but I’d actually recommend the fig manhattan, made with fig-infused bourbon, instead. I suspect it’s not on the menu (the vanilla one is) so be sure to ask for it by name. I really enjoyed Matt’s Chili Margarita. 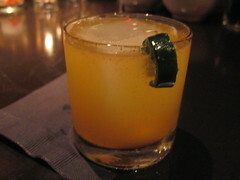 Made with Patron tequila, agave nectar – the margarita gets its “chili spice” from cayenne pepper. Lime and blood orange juice open and sweeten the cocktail up quite subtly. The metzcal spray on top is a nice touch. I love my margaritas spicy! No sweet & sour allowed – just fresh juices. Once you adhere to these rules, your margaritas will have no semblence to those bad memories of tequila you may have created in your early-20s. But let me get back to that Bloody Mary. It’s not to be taken lightly and enjoyed thoroughly. Matt has worked on this one for awhile and finally came up satisfied with a 17-step recipe. No kidding! My notes couldn’t keep up – much to his credit. To start off, he muddles cherry tomatoes, cucumbers, red bell beppers, dill and scallions. Fresh olive juice from the Farmer’s Market is combined with dashes of Tabasco (love that part), fresh black pepper and horseradish. Hangar One mandarin vodka and bloody mary mix go in followed by multiple colors of cherry tomatoes for a bright effect but so do two different kinds of basil (purple and flowering). Did I mention I love basil? I am sure if more kinds of basil were readily available he might include those, too. I’ll say it. 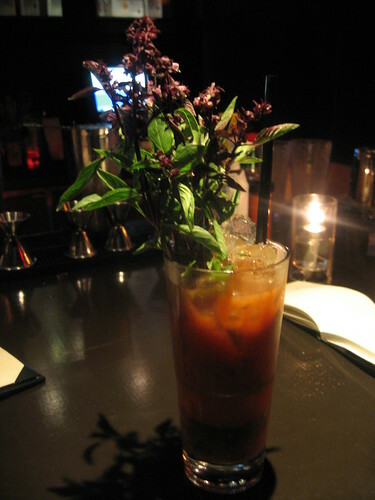 This was the best bloody mary I’ve ever tasted. It was complex, spicy, fresh – and not too salty. And again, it was fragrant. For the drinks in the rocks glasses, no detail is left to chance as Library Bar uses Neve ice. Just the perfect size to fit in the glass and maximum drink surface area for a perfectly chilled refreshment. The Basil Mojito was no exception and another favorite of mine. Complete with malibu rum, purple basil, squeezed lime, agave nectar and white peaches – this drink wasn’t too sweet, which I was surprised at, actually. It was light thanks to the white peaches and just a tasty drink overall. It reminded me of a light summer day. I used to think that if I weren’t at an event or otherwise one-off at The Roosevelt Hotel, you wouldn’t catch me dead at Teddy’s or Tropicana – but perhaps inside 25 Degrees getting one of my favorite burgers. Now The Library Bar is another legit reason to be seen inside the hotel. I can definitely reward a passion for fresh ingredients with my occasional patronage – the drinks are worth it if I’m feeling adventurous and need to be schooled with something new this side of my typical vodka-tonic. 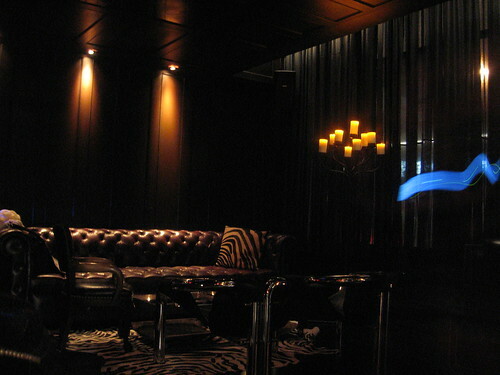 This entry was posted in cocktails, Hollywood and tagged cocktails, Farmer's Market, Hollywood, Hollywood Blvd, Library Bar, Matt Biancaniello, Roosevelt Hotel. Bookmark the permalink.